Published on Monday, April 15, 2019. This article appears in the April/May 2019 issue of American Craft Magazine. Blue Butterfly, 2017, hydrangea, 5.5 x 5 in. 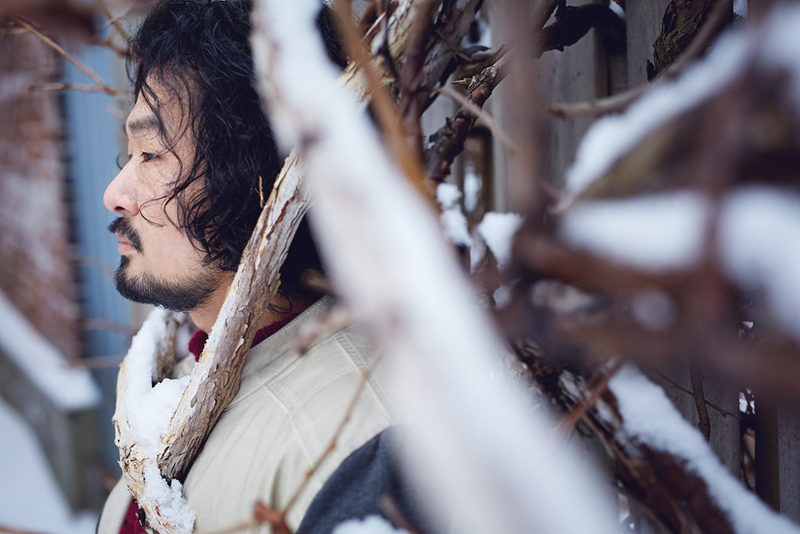 Raku Inoue never really knew his grandfather, who died when he was very small. But every summer growing up, he’d travel from his home in Tokyo to visit his grandmother near Hiroshima. “She would open the door, and this dragonfly would come in,” he remembers. “She would say, ‘That’s your grandpa, reincarnated.’ ” Ever since, he has thought of insects as symbolic – even supernatural – beings. 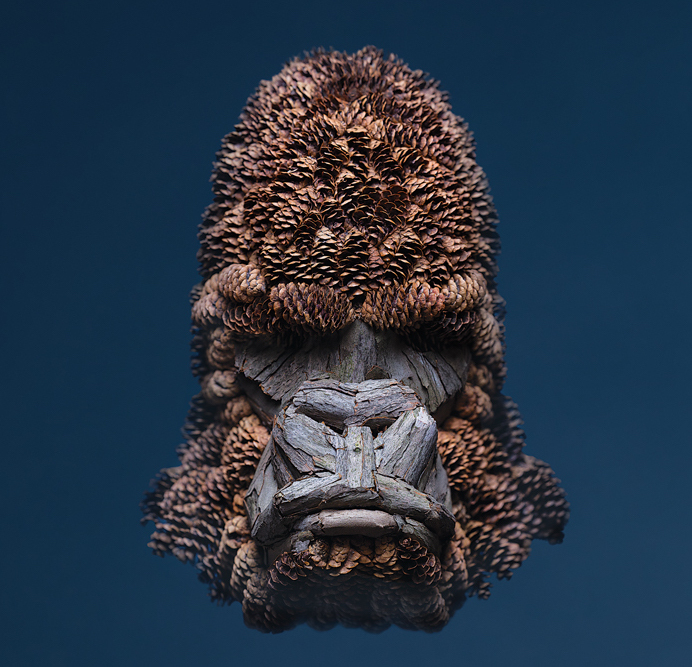 Today, the 35-year-old makes his own magical insects out of plant fragments he gathers from his backyard in Montreal and elsewhere. His palm-sized flights of fancy delight the eye and imagination. A firefly with a buttercup bottom emits a glow of yellow dandelion petals; a stick-bug, the kind that mimics a branch to survive, is made of – well, a stick, with propeller seeds for wings. 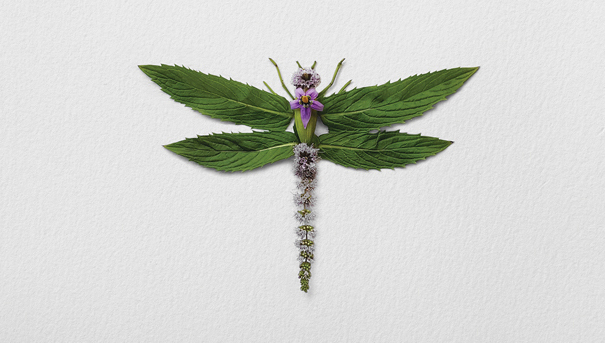 Naturally, Inoue has done a dragonfly, using bits of mint – a flowering sprig body, tiny stem legs, leaf wings – and a belladonna boutonniere. 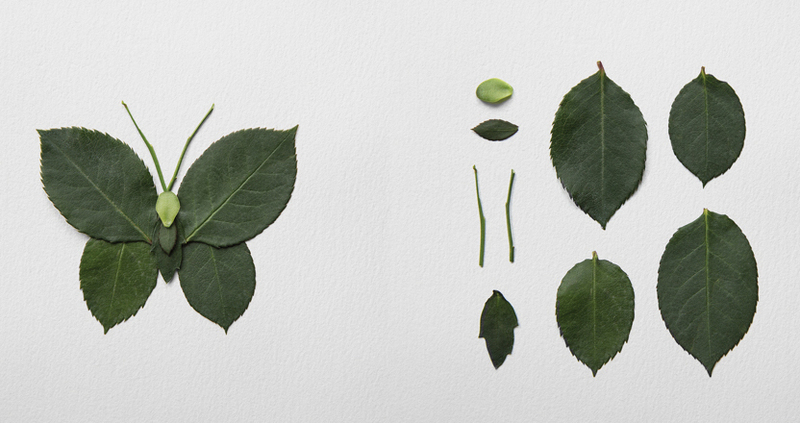 Leaf Butterfly (2018) in unassembled and assembled form. Building each piece with an eye to graphic design “allows me to present my work with a certain quality of thoughtfulness,” the artist says. An Ecuadoran flower exporter provided the baby’s breath for Jewel Beetles (2018). A local flower shop calls Raku Inoue when it has merchandise just past its sell-by date. For Antenna Beetle (2018), he took some alstroemeria off their hands. For a 2018 series, Inoue turned to sturdier materials: tree bark, oak chips, pine cones. Though less delicate than flower petals, the elements aren’t permanent; the pine cones, for example, shrink as they dry out. 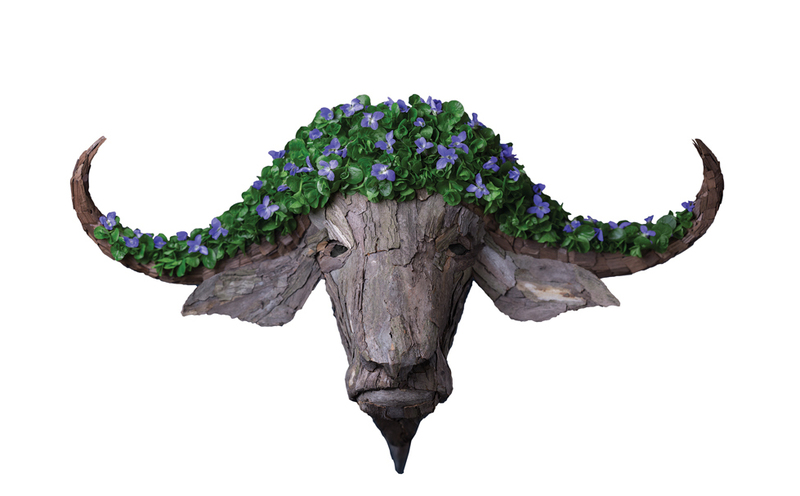 Stag Beetle, 2017, hydrangea, crocus, mint flowers, 6 x 4.5 in. Each insect embodies the colors and textures of a season. 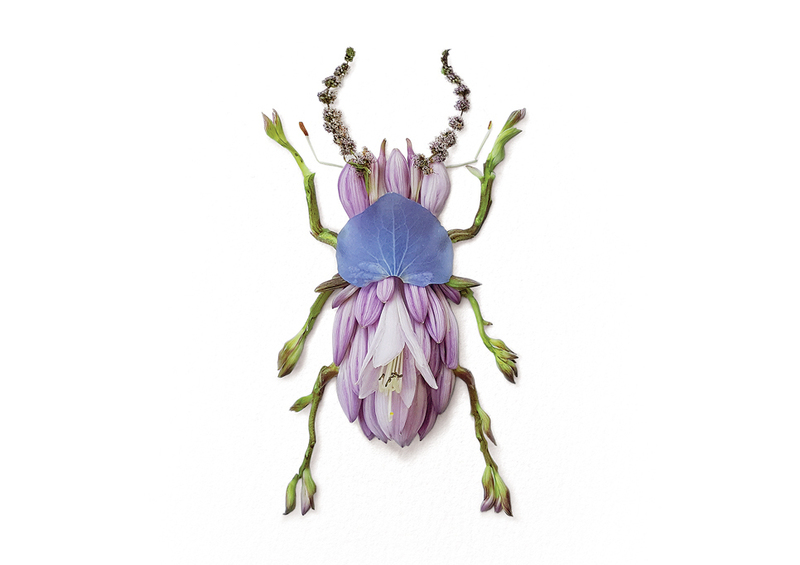 A stag beetle sports feathery finery of summer wildflowers and a single deep-blue hydrangea petal. A butterfly blazes in the fiery red and orange of fall foliage from northern Quebec. In winter come creatures crafted of conifer needles and pine cone scales, sometimes with translucent bodies made of ice. It melts, and that’s fine. Once Inoue completes an insect, he photographs it, then immediately adds it to a compost heap. When Inoue was 9, he moved from Tokyo to Montreal with his mother, who worked as a translator, and her Canadian husband. He struggled at first to adapt to a new culture and learn both French, the official language of the province, and English. “My stepfather would translate my homework to my mother from French to English, and she would explain to me in Japanese,” he recalls. “It wasn’t fun.” Drawing became a means of escape. “I lived very much in a fantasy world, my cartoon world. I was always into visual things. Instead of reading the encyclopedia, I would look at the images and learn that way.” His teen years were, he says, “a dark time. I did heavy drugs. I was a frustrated kid, rebellious.” He quit high school and left home, working restaurant jobs to support himself. Feeling renewed, he came back to Montreal and enrolled at Collège Salette, a design school. Since leaving in 2010, he has worked on everything from graphic art, illustration, and photography for editorial and advertising clients to polymer clay sculpture, creative direction for music videos, and screenprinted apparel. “I’m like a chameleon,” he says of his multidisciplinary career. 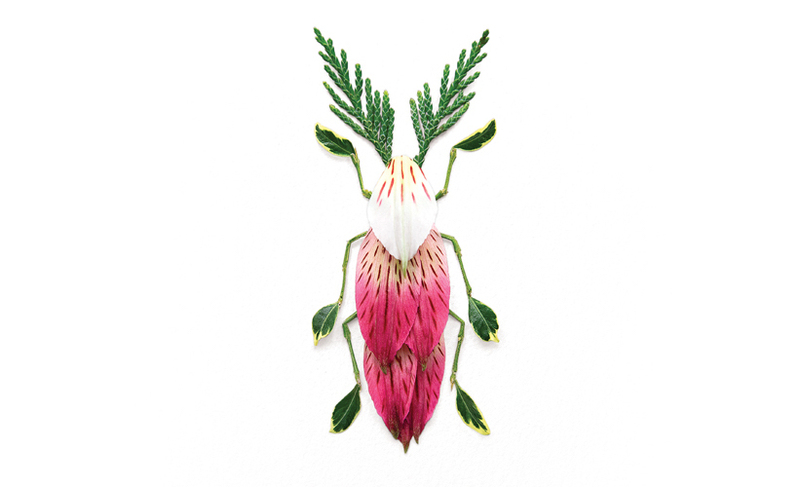 Inspired by the traditional Japanese art of ikebana, he made flower arrangements, then one day decided to try an insect shape. It became a creative exercise. 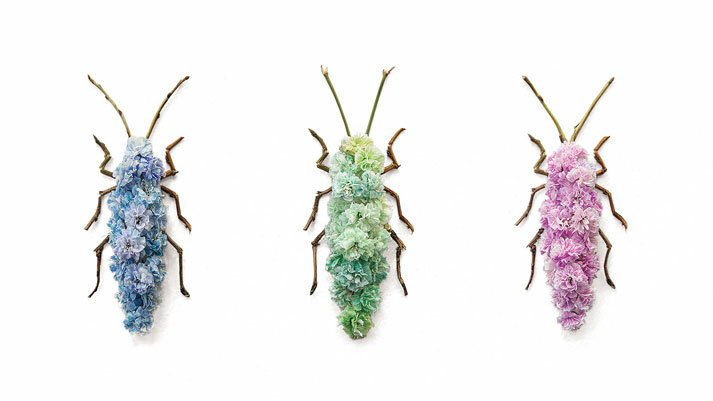 “I would wake up in the morning, drink my coffee, do an insect, take a picture with my cell phone, and post it on Instagram.” His first series, a collection of nine insects in exuberant spring colors, went viral, bringing him media attention and commission offers. No longer just a hobby, the insects are now a mainstay of his practice. He’s experimenting with floral art pieces that are a little more permanent, using polymer clay. “The challenge is to marry plastic and natural materials in a harmonious way,” he says. Lately, he’s also venturing into three dimensions, sculpting animal busts: a conifer-needle tiger, a pine-cone gorilla, a tree-bark buffalo.